Everyone has the power to teach what they know! If you aren’t quite sure about how and why blog content can be valuable, check out my other post here on the value of teaching what you know, to see if this could be for you. Grab the content planning guide here! What are the top 3 things/aspects of my business/subjects that I consider myself knowledgeable/expert at? What 5 questions/topics do most customers most often ask me about? What are the top 5 myths/misconceptions in my industry that I can educate people on? What are the top changes/trends happening in my industry that customers are confused by? Why is this a question that a customer should be asking? How is this a benefit that is derived from your product or service? Remind them that they are empowered to go out and make a confident decision/try this at home, etc. Blogging is possible when you write what you know. You already have the knowledge, you may just need a process for getting the information onto paper/voice note/type. 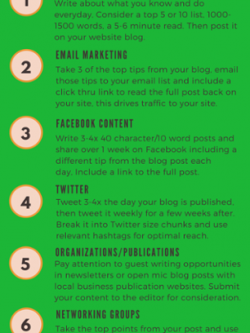 Hopefully this step by step post and the 12 month content planning guide have empowered you to write your first post! Comment back here with a link to your post. We can all help each other when we teach what we know!